FACT CHECK: Does This Photograph of a Marine Saluting the U.S. Flag Violate Twitter's Rules? Does This Photograph of a Marine Saluting the U.S. Flag Violate Twitter’s Rules? Despite claims that an image of a marine saluting an American flag was deemed offensive by Twitter, we found no evidence that it violated the company's rules. 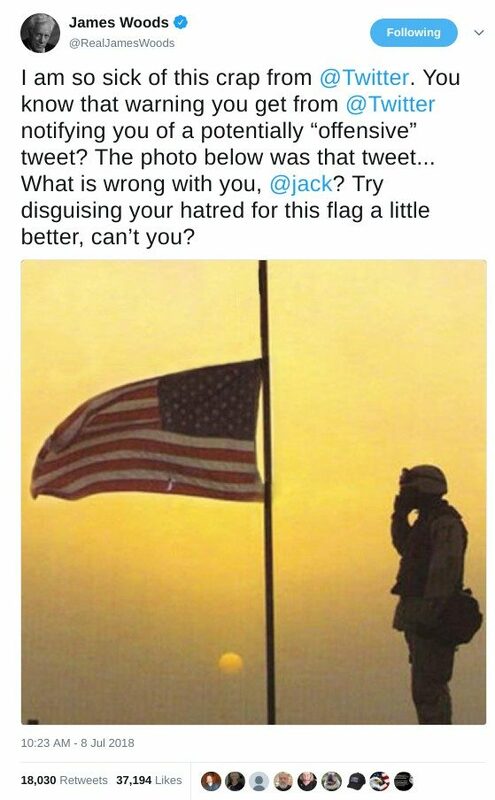 A photograph of a marine saluting a U.S. flag violates Twitter's rules and policies. I had two failed marriages before I met James. I thought I was destined to be single. We met through a mutual friend who knew I was getting stationed in San Diego and suggested I contact him. We became the best of friends, crying on each other’s shoulders over other relationships, and eventually became romantically involved. In January 2003, my parents made a trip to San Diego to see me one last time before I deployed to Iraq. They met James for the first time, and without any prior discussion, James looked at my father and told him he would like to marry me. I remember him saying, we don’t know what will happen once we get over there and he did not want to miss the opportunity to have me for his wife. I was totally on the spot, but I said yes. We were married Jan. 25, 2003. Two days later, he left for Kuwait and I deployed shortly thereafter. He always used to joke that he gave me six months of all the sun and sand a girl could want on a honeymoon. We were from different units, so we weren’t sent to the same places. After the war began, I was escorting media, and we flew into a desert airfield in southern Iraq. My husband’s unit was the base air traffic control unit. Coincidentally, it was my husband’s turn to take down the flag and perform the evening colors ceremony. I grabbed my camera and happened to catch the photo you see. That photograph was later released by the U.S. Marine Corps has been widely shared online (often without attribution) in the ensuing years. It has been posted on numerous blogs, web sites, and social media pages, made into tattoos and postcards, and has even been included in multiple Memorial Day messages posted by the rock band KISS. We attempted to contact Woods about the warning he allegedly received but did not receive a response. It’s possible that he truly did receive such a warning (he didn’t state whether the image was accompanied by any text, which could have been the “offensive” portion of the tweet), but we’re skeptical that the image alone raised any red flags with Twitter, for a number of reasons. That 2015 tweet has resided on Woods’ timeline for three years without issue. As of this writing, it is still available. We searched Twitter for other instances of people sharing this photograph over the years and came up with numerous examples, including at least one case in which a user adopted the image as their profile pic, and a tweet from Lara Trump in May 2018. If Twitter truly deemed the image “offensive,” these posts would have likely been taken down. However, we’ve yet to come across any credible instances of the social network removing this photograph for violating its rules. So is the photograph in violation of Twitter’s rules? 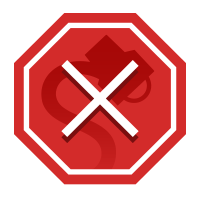 The social network’s guidelines are extensive, but we couldn’t find any provisions under which images of national flags, soldiers, or patriotic activities would be deemed offensive. repeated and/or non-consensual slurs, epithets, racist and sexist tropes, or other content that degrades someone. 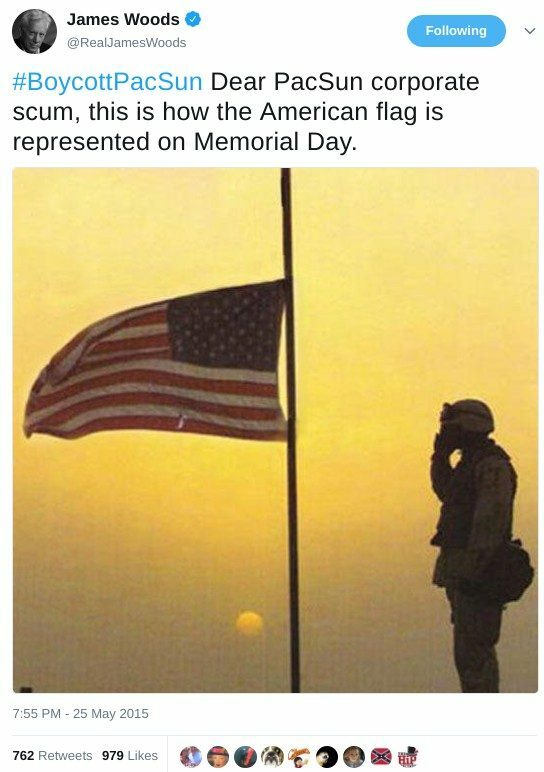 As it has been repeatedly shared on Twitter without issue for a number of years, it seems safe to say that this photograph of a marine saluting a flag does not violate the social network’s terms of service. We investigated this rumor back in 2015 and found that it, too, was false. It’s possible that Woods received a warning message about “offensive” content after posting an image of a marine saluting a flag, but if so, it’s likely that the warning had more to do with the accompanying text than the image itself. It’s also possible that the warning Woods allegedly received was due to a Twitter user, not the social network itself, flagging the content for being inappropriate for some unexplained reason. We can say, however, that the photograph of Master Sgt. James E. Valrie saluting the United States flag is not itself in violation of Twitter’s rules. Unfortunately, with all the wonderful ways it has been used, the photograph has also been manipulated and in some cases used in ways I found disrespectful. On Memorial Day, the flag is sometimes moved to appear at half-staff. 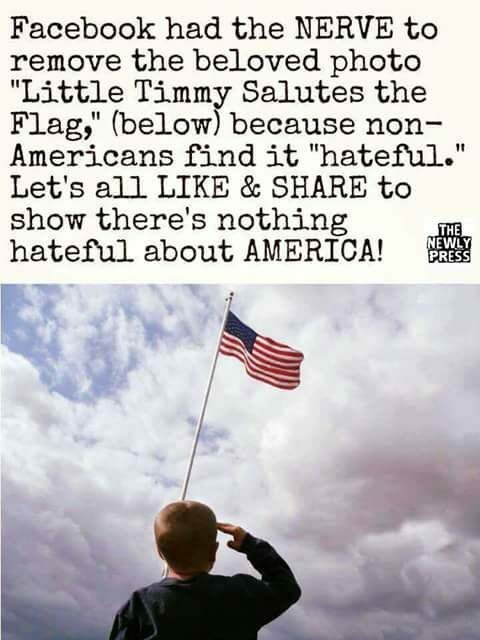 People have flipped the photograph, I’m sure to make the flag fly in the other direction, but by doing that, it makes my husband look like he is saluting with the wrong hand. In one case, the flag was turned upside down and used on an antiwar site. It makes me so angry when I run across it being used in a manner that does anything less than pay tribute to our country’s service members. This photograph has been a wonderful tribute — kind of me and my family’s own private little tribute, as very few people knew the story behind it, that it was taken of a Marine, by a Marine, and they were married. I am honored when anyone wants to use it. But this photograph has such deep meaning to me, my children and James’ family, that it is often difficult to swallow when we see it abused. Los Angeles Times. 20 March 2013. USA Today. 26 May 2015.